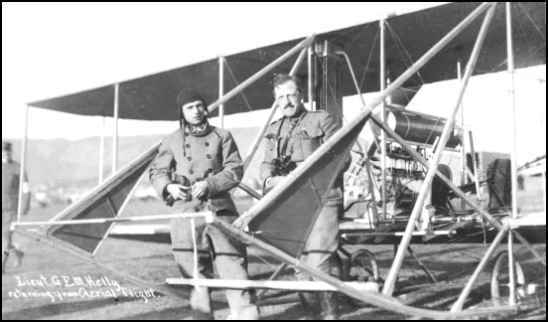 The first Military Aviation School in the United States opened on North Island January 17, 1911. 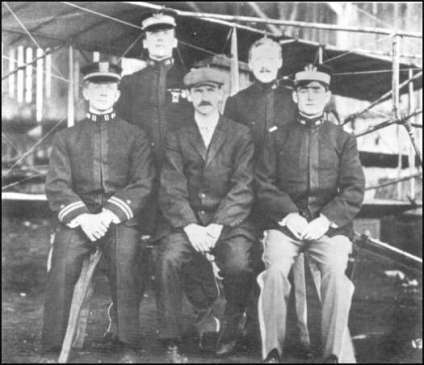 Instructor, Glenn Curtiss, center. Students, left to right: Lieutenant T. G. Ellyson, Navy; First Lieutenant Paul W. Beck, Army; Second Lieutenant G. E. M. Kelly, Army; Second Lieutenant John C. Walker Jr., Army. Transcribed by Bob Davis - 3-31-04 These men have received orders from the war department at Washington to proceed to the manoever division at San Antonio to participate in "aviation work." 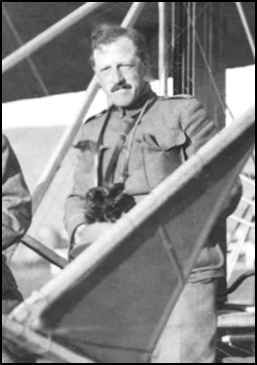 Two aviation camps will be established at the manoever division - one for the Curtiss machine and the other for the Wright aeroplane. Three separate portraits of Lieutenants Paul W. Beck, George M. Kelly, and John C. Walker, Jr.
ONLINE RESOURCES If you search for "George E. M. Kelly" +aviation, using the Google search engine, (9-23-09), you will find about 170 links. Perhaps the most helpful is the following. A TRIBUTE TO KELLY AIR FORCE BASE This website offers a very interesting revue of the history of Kelly Field. It records a few details of Lt. Kelly's shortlived career, including the fact that he was born in Engliand and imigrated to the United States. You will find mention of some of the other important names in early aviation. Vin Fiz This page includes three interesting references to Lt. Kelly, including one remark attributed to him on January 17, 1911. You may want to use the "FIND" function on his name to locate them in the text. While there, I recommend that you browse the whole site.